Packers QB Aaron Rodgers has been nominated for the league’s Air Player of the Week following his 327-yard, three-TD performance against the Falcons on Monday night. Rodgers finished the game with a 123.3 passer rating. Pittsburgh’s Ben Roethlisberger and Detroit’s Matthew Stafford are the other Air nominees for Week 14. Fans can cast their votes by clicking here. Packers QB Aaron Rodgers has begun a campaign to support the war-torn Congo with an offer to fly a lucky donor and a guest to the Packers-Falcons Monday night game on Dec. 8 to join Rodgers on the field during pregame. To donate to Raise Hope for Cong” and enter to win, click here. Raise Hope for Congo is an Enough Project Campaign that is working to end the deadliest war globally since World War II. The program provides activists with tools to educate themselves and their communities about the conflict in Congo, the role of minerals fueling the conflict, and the effects of sexual violence used as a weapon of war. Recently, Rodgers partnered with Raise Hope for Congo to stage a rally at the University of Wisconsin-Madison to raise awareness about what students could do to help end the conflict in Congo. Five Packers players are currently ranked in the top two at their respective positions in the Pro Bowl voting that is ongoing on NFL.com. Aaron Rodgers is the No. 2 vote-getter in the entire league and also No. 2 at quarterback behind Denver’s Peyton Manning. John Kuhn leads the voting at fullback, while Jordy Nelson and Josh Sitton are second at receiver and guard, respectively. Jarrett Bush is also ranked second in the voting for special teams. Nelson is No. 9 in overall votes at all positions, the only other Packers player in the league-wide top 10. Fan voting continues until Monday, Dec. 15, and fans can vote by clicking here. Fan voting counts one-third in the selection process for the 2015 Pro Bowl. For a look at the latest vote totals, click here. GREEN BAY — For the second straight week, Packers QB Aaron Rodgers has been voted the league’s Air Player of the Week in a vote of fans on NFL.com. Rodgers threw for 341 yards with three TDs, posting a passer rating of 120.3, in the Packers’ win over the Eagles last Sunday. 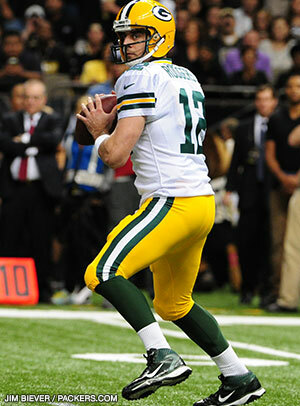 QB Aaron Rodgers has earned the third-most votes overall (280,394) in fan voting for the Pro Bowl. Rodgers trails only Denver Broncos QB Peyton Manning (359,598) and Indianapolis Colts QB Andrew Luck (284,575). Three Packers lead their positions in fan voting: FB John Kuhn (78,995), G Josh Sitton (55,333) and ST Jarrett Bush (25,224). Fan voting continues through Monday, December 15. Voting by the players and coaches has not yet been tabulated. Fan voting counts one-third in the selection process for the Pro Bowl rosters, which will be announced on Tuesday, December 23. See previous Packers Pro Bowlers here. Packers QB Aaron Rodgers’ game-winning touchdown drive last Sunday in Miami has been voted as the NFL’s Never Say Never Moment of the Week for Week 6. The Packers’ comeback actually started with Rodgers directing a 68-yard drive for a field goal to get Green Bay within 24-20 with four minutes left. Getting the ball back with just over two minutes to go, Rodgers then drove the offense 60 yards for the game-winning score, a 4-yard TD pass to TE Andrew Quarless with just three seconds on the clock. The drive included an 18-yard pass to WR Jordy Nelson on fourth-and-10 and a fake-spike play that resulted in a throw to rookie WR Davante Adams for 12 yards. Packers QB Aaron Rodgers has lent his support to the “Gold in September” campaign. The mission of “Gold in September,” a month in which people are encouraged to wear gold, is to raise awareness and inspire action for childhood cancer initiatives. Gold is the official color for pediatric cancer awareness month, September. The campaign was started by Annie Bartosz, an 11-year-old from Hartland whose twin brother Jack lost his fight with cancer two years ago. Rodgers had become close with Jack after meeting through the MACC Fund, a Midwest-based charity dedicated to funding childhood cancer and related blood disorder research. Rodgers surprised Bartosz by dropping in prior to a video interview she was about to shoot. The two went door to door near Bartosz’s home to explain “Gold in September” to neighbors.